My name is Nik Papageorgiou. Yes, that’s Greek, and so is half my genotype. Back in the days of yore, I used to be a cell biologist with a PhD in neurodegeneration (think Alzheimer’s etc). I ran the gamut of academia (degree-postgrad-PhD-postdoc-despair), and now I work in science communications at EPFL. I love science, but I lament the current state of the scientific business. I also write fiction. 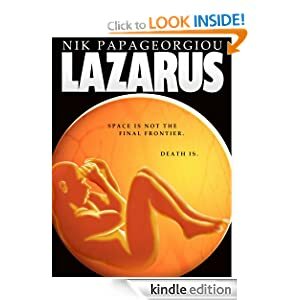 Some of my short stories have featured on Lablit.com, and my first novel, Lazarus, was published in 2012 (Amazon | Smashwords). One day, sighed many a novelist, there will be more. Strangely enough, I’m mostly known for my comics. They came to be through unemployment and disillusionment, and I’m still surprised by how popular they have become – especially since I can’t really draw, which I hear is an important skill for cartoonists. Nonetheless, I have the privilege to contribute to Chemistry World and EPFL’s magazine on a regular basis. I am also a Christian. This is the best thing that’s ever happened to me, and I hope it defines me above all else. I dig into theology, apologetics and philosophy a fair bit, all of which generally lead me to hold Reformed views. Finally, I’m an abstract sequential thinker and an INTJ. I share those utterly useless details because they might explain why, despite the multitude of science comics, this blog doesn’t really have a single theme – and why I’m still calling it a “blog” instead of a “website”. Another reason is that I don’t know anything about web design. You kids today. I hope you enjoy the Upturned Microscope. For fuller experience of said enjoyment, you can also visit it on Facebook and Twitter. And if, for some reason, you want to find out more about me, you can check out my LinkedIn profile. I promise you it’s a riveting read. If you have a number of novels written already you should look into self-publishing them. A good place to start is at a site called Smashwords – http://www.smashwords.com – you upload the book and then they convert it to all the different ebook formats (for Kindle, Nook, etc.). Then after they manually check the formatting they push it out to the various ebook shops like Barnes and Noble, Apple bookstore, Nook store and soon Amazon as well. Thanks for the link (and apologies for the late reply). I’m going down that route, since life is short, but I’m starting with Amazon and depending on how that goes, I’ll expand to other formats. I really like your comics! They are very funny. Hey Nik, I’ve just finished reading all your stuff! Love your material and the way you write…..also having been a postdoc for 8 years and having left academia a year ago, I *totally* understand what you are talking about. I ended up working in a really famous university, but no matter how I tried it was just impossible to stay….and frankly I’m glad I didn’t….my life in industry has proved 100 times better. There is a level of brainwashing that occurs during the early period of a postdoc that is hard to deprogram. It is easy to blame academics but in reality they are also victims of the funding system and the number of people wanting to do research. To be fair postdocs themselves also need to take some share of the blame….the evidence for declining opportunity is clearly evident if you give yourself even a short time to investigate. None of the facts on academic employment are hidden…..you just need to give yourself the time to look at it! I think the tipping point for me was a period when I worked very closely with my Professor as a teaching fellow interacting with about 50 academics. I realised that even if you did get an academic post this was not the end of the hard slog but actually just an extension. Young academics in my University worked just as hard as the Postdocs….sure they had a form of job security, but the pressure to win grants and the amount of admin, exams etc etc would send shivers down your spine. A fellow postdoc spent 2 years looking for an academic post. To his credit after about 6 interviews he scored a lecturship at a very minor country university. His reward is to teach no less than 43 hrs of lectures a term….forget about winning a grant or having time to do research…..some prize. One caveat on moving to industry though should be that you really should only work in a place where the managment also have PhD’s. If this is not the case then your qualification and background will never be understood or valued. But generally this should usually be the case anyway if you plan on using your research skills. The silver lining to all this is that commercially I think society will benefit much more with researchers working outside of universities than inside. I have gone down the path of trying to commercialise research through the university and in general UK universities are very poor at this. I now work in industrial research and whilst commercialisation is still difficult, you have a much greater chance of success…..and for me this is the real goal, to know that your research has made a tangable difference and is not just an intellectual story that nobody understands. Thanks for sharing, David – and for your kind words. You know, these are really the kinds of insights that were missing during my spat in academia (just 2 years postdoc, nowhere near as much as you). And you’re right, there is a kind of “programming” that goes on in academia that is really unfair to PhDs and postdocs. Being made to feel like a loser simply because you don’t pursue an academic career route is unacceptable, and yet it’s a definite trend. I’d personally love to see PhDs/postdocs develop and progress transferable skills and become better educated about what lies beyond the academic research world. Thanks for sharing and stay in touch! Hello, my name is Mariel, and ever since discovering your site I have once again garnered my strength to do the whole grad school application process again. I did some time interning at a molecular and human genetics lab at the university and I loved the work. I remember writing in a post it the day that was to me the happiest day day… and it was when I finally had a hand of doing what I loved, and that was science and unearthing new information. I hope to get in to grad school and pursue evolutionary anthropology/ genetic anthropology. Your depiction of lab culture is reminds me every day that that’s what I love 🙂 thank you. So with that I would like to let you know that I am awarding you the very inspiring blogger award. But in the end, science is driven by passion – and if you have it, you’re really halfway there. Many thanks again, and all the best with your applications! I love your comics and just finished your awesome book. I can hardly wait until the next one comes out. Keep up the great work and thank you for sharing your insights with us. Thank you very much for your kind words… it means so much to me to hear such encouragement, especially as I’m venturing into novel-writing without any conventional support. My next novel, SOVEREIGNTY, is undergoing a massive re-write. I’m really hoping that it will be released later this year. Once again, thank you for writing. Keep the comics coming, they’re awesome. I live in British Columbia, was able to visit the Brain Lab at EPFL in 2008 when on a trip to Europe – still my favorite school in the world (not that I’ve seen them all but whatever). I love that they have raclette nights like we have pub nights here – would trade for those any day! And INTJs are likely to thrive in that environment; I know I would. Thanks for the research that you do, world changing kind of stuff. and the comics, very validating. You have an awesome blog and I have nominated you for the One Lovely Blog award. Please check out the link below for further details. Hi! I just wanted to say that your comics are amazing. I love your posts and short stories and enjoy them a lot so thank you for those. 🙂 I’m an undergraduate biology student who’s thinking of entering med school or enrolling in an MS program. Aside from my love for science, I also love to write, and that’s probably why I enjoy your blog so much. Keep up the great work and God bless you! I’m a science student soon entering my last year of undergrad. I now am faced with the choice between persuying grad school or trying to get into a professional school (like pharmacy). I’ve working in labs during my whole undergrad and really love research and the dynamic lab environment but I’ve been warned countless times about the hard work-low reward aspect of research. Your blog also opened my eyes to what life would look like if I went into research. At this point I’m starting to think that maybe it’s a better idea for me to choose a path that would give me better opportunities and job security although I would never really do what I love. What do you think? Is a career path in reasearch doomed to end in regret? Thanks for your help and keep up the great work with your blog! Far be it from me to discourage you from doing what you love. My research story isn’t yours, and vice versa. Also, I don’t know your specific circumstances, so it would be irresponsible on my behalf to give you any kind of career advice. Suffice to say that, if you do go into research, go with both eyes open, well-informed and well-researched, and always with a solid, up-to-date escape plan. In research, cost exceeds worth very quickly, so stay clear about what you really want and what you value. Few things are worse than hating what you once loved, so make sure that if you do quit, quit while you’re winning. All the best with your decisions, and thanks for being a fan of the blog! I was reading your “About” page instead of reading papers the other day, and realized you’re a Christian. A Christian with reformed belief and linked “reformed” to the westminster seminary (the one I want to attend in future), woah! It is encouraging to see a Christian scientist for a bio majored undergrad… I am curious on how you deal with your biology understanding and your faith? How I deal with biology and my faith? That’s not an easy answer – and that’s my overall attitude to it, to be honest. My foundational assumption (my a priori) is that there cannot be a discrepancy between the Bible and truth. If there is, it’s either because we have insufficient data or insufficient hermeneutics. Blessings, and all the best on your studies! Great comics for sure! How anyone who understands evolutionary bio. Can be into any single religion is mystery. Anyway I am constantly upset with movie and tv scientists, so I was especially entertained- thanks for the chuckles. I love your acid and base cartoon. Any chance I can use it for my science website?